Our primary data center is multi-homed using Level 3, Cogent, TeliaSonera, XO Communications, and GTT/nLayer. Level 3 and GTT/nLayer are the largest backbone providers in the United States and TeliaSonera is the largest in Europe. This allows efficient delivery on both sides of the Atlantic. In addition, our direct connection to the 56 Marietta Street TELX facility provides a link to a tremendous number of local, regional, national and international backbones. 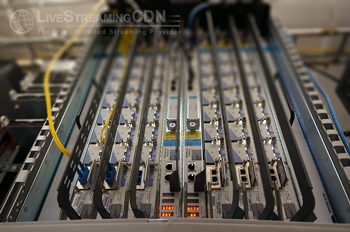 Each service is connected using a Cisco Nexus 7000 series switch and Cisco CRS 8 router with 10Gbps ports. The Atlanta center currently has 80 Gbps lit and another 60 Gbps dark. Second tier switches are Cisco 7000 series and are all connected redundantly in such a manner so that there is no single point of failure in the network. 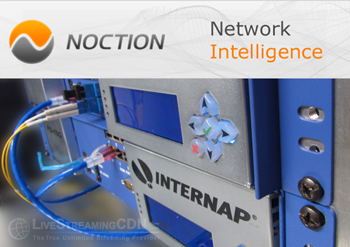 LiveStreamingCDN uses Internap's Managed Internet Route OptimizerTM (MIROTM) and Noction's Network Intelligence to optimize routing efficiency. These technologies determine the fastest route by which to deliver content based the use of actual traffic to measure end-to-end performance for latency, packet loss, route stability and congestion. They automatically re-route traffic to guarantee performance levels for your streaming video. Our ability to report on network performance, perform forensic analysis when problems occur, and manage your service providers to their Service Level Agreements (SLA) provides a tremendous business advantage to our clients. Our primary data center is multi-homed using Level 3, Cogent, TeliaSonera, XO Communications, and GTT/nLayer. Level 3 and GTT/nLayer are the largest backbone providers in the United States and TeliaSonera is the largest in Europe. This allows efficient delivery on both sides of the Atlantic. In addition, our direct connection to the 56 Marietta carrier hotel provides a link to a tremendous number of local, regional, national and international backbones. 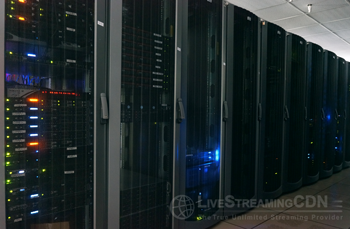 Each service is connected using a Cisco Nexus 7000 series switches and and Cisco CRS 8 router with 10Gbps ports. The center has 80 Gbps lit and 60 Gbps dark. Second tier switches are Cisco 7000 series and are all connected redundantly in such a manner so that there is no single point of failure in the network.